You are here: Home/ News/ Jason is a winner! What Staffordshire based Jason Kelly believed to be a prank call on him, in fact turned out to “the best news of the year”. 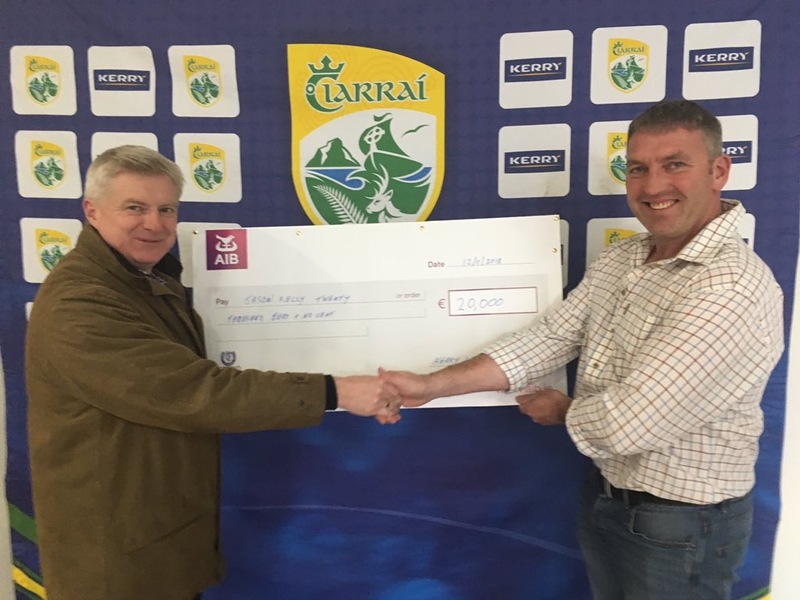 Still in a state of disbelief, Jason originally from Glenflesk arrived in the Kerry GAA centre of Excellence with his father Tim last Monday afternoon to collect the winnings of €20,000 from Kerry GAA Treasurer Dermot Lynch. Jason had received the call from Kerry GAA PRO Leona Twiss after his winning in June and told her that he would be back in November. Like many Kerry GAA, fans Jason emigrated to England in the 1980’s and it is now home for him, his wife and two sons. Admitting it was a longing to check on some scores that led him by “pure luck” to stumble on the Kerry GAA online Lotto. “It is very professional. Brilliant altogether. They have it all focused on the player which is great. Maybe I’d come back next year and watch them training.” Jason concludes, as he gets ready for his brother’s wedding later in the week.